Two years ago today I said "I do" to the man of my dreams, my soul mate, my best friend, Art. That was without a doubt the happiest day of my life! How could it not be? I married the man I love, the man who makes me feel blessed every single day, the man who always knows how to make me laugh, the man who makes me feel loved. I am uncontrollably and immensely in love with my husband. He is the reason I breathe, the reason I dream, the reason I believe. Because of him I have faith, I love, I smile, I pray, I thank God. Art, thank you so much for loving me for who I am. Thank you for knowing me better than anyone else and for loving everything you know about me. I've loved growing up with you by my side and I hope to grow old with you right next to me. Art and I will take the day off today to celebrate our anniversary. That means that I will not have any e-mail, internet or phone access. I will reply to any phone calls and/or e-mail on Wednesday. You look gorgeous!!! Definitely very happy! Happy anniversary! 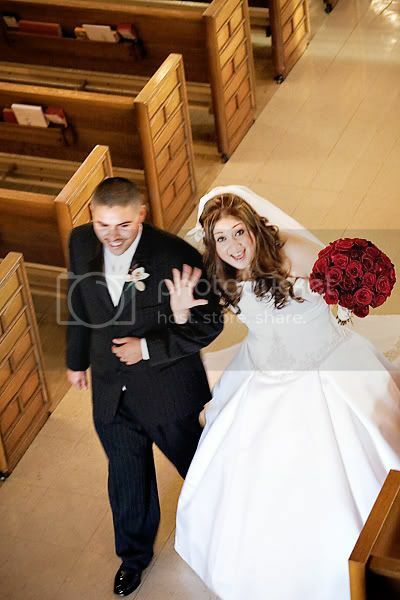 You looked gorgeous and beaming with happiness on your wedding day!! We want to see more pics!! Happy anniversary! That is such a cute picture! Youlooked great and Art looked very handsome :) You make a great couple. I am so happy to have an awesome couple photograph our wedding! Congratulations on 2 years of wedded bliss. I really thought you were married longer than that for some reason. Either way, your love for each other radiates through your work and the way you capture the love between other couples. You're definitely in the right business and I look forward to working with you! happy anniversary... and you do look so friggin happy!! Happy Anniverary! I love the photo! I agree I want to see more pics of my photogs wedding! Looks like you don't only know how to make weddings look beautiful through the photos you take but you also had a beautiful wedding too! Congrats to both. Happy anniversary Nat and Art! I know Art will melt when he reads this! You are so sweet! happy happy anniversary you guys!! hope you have a blessed day!! that pic is too cute!!! So sweet! Brought tears to my eyes. :-) Congratulations, and I agree with the person above--something about your closeness and the way to talk about Art made me think you've been married much longer! Hope you had a wonderful day! I love this picture. Congrats to you both. You guys are such an awesome couple! Thank you so much for the blog love on our anniversary :) It means a lot to us! To those who thought Art and I were married for much longer, Art and I have actually been together for 10 years as boyfriend and girlfriend. We were barely teens when we first started going out. Can yo ubelieve that?! I may be late but anniversaries should be celebrated all year long anyway. ha! Happy belated anniversary!! Love love love that photo... you do indeed look super happy! Congratulations on two years!